For the NFDT Blue Angels team pilots and crews, USNSL. "How do I become a Blue Angel?" The Navy Flight Demonstration Team (NFDT) Blue Angels mirrors in Second Life the real life team and its purpose: to be the ambassadors of the US Navy and an example of the knowledge of flight and discipline all naval aviators embody. To become one you need to be a certified naval aviator within the US Navy SL structure, which means an ongoing career that starts with USNSL Officer Candidates School (OCS) or SLMC Basic School. You must be a carrier certified pilot with service in an active duty squadron and a minimum of 150 hours (USNSL) or 100 hours (SLMC) flown as a naval aviator in jet aircraft. You then apply for a tour of duty with the Blue Angels, through your command. SLMC pilots applying for the C-130 crew positions must have the same career background as any naval aviator, be in an active duty squadron and have a minimum of 80 hours flown in multi engine aircraft, propellers or jets. Tours of duty with the Blue Angels are requested through each naval aviator/enlisted person's command and must be recommended by his/her commanding officer. Each Blue Angels pilot and crew member remains active in their assigned USNSL or SLMC units. The team examines each candidate and accepts him/her unanimously. Ground crews are required the equivalent level of excellence and should be active duty USNSL or SLMC enlisted personnel with a minimum of 2 months with their assigned units. 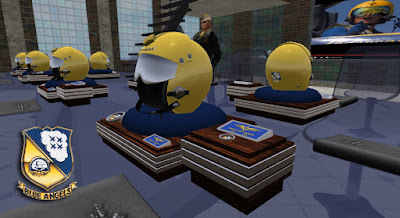 There are only 8 Blue Angels assigned positions by number, although the steady number of officers in the team is 30, in Second Life's NFDT. The team's ideal formation has 7 Alpha and 7 Bravo pilots, 1 Alpha and 1 Bravo Events Coordinator, 1 Alpha and 1 Bravo Marine C-130 pilots and 6 Alpha and 6 Bravo Marines as support. There are a few differences between the RL NFDT and SL's for obvious reasons. For Second Life USN purposes as the team is, as in real life, the Navy's ambassadors squadron, all members including SL USMC crews are given a NAS Miramar position to use group privileges (such as exclusive communications - see below). As part of the NFDT, NAS Miramar is the team's operational station, while NAF Eagles Nest remains its home facility. 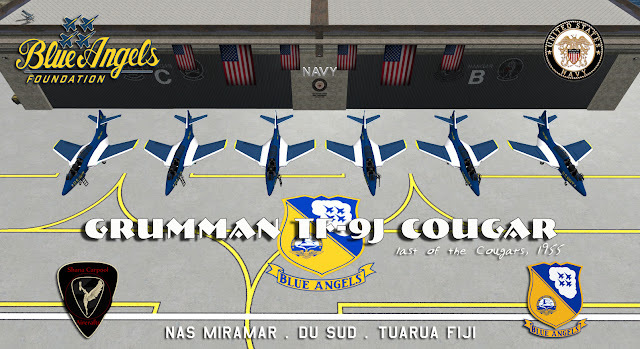 The Blue Angels in Second Life's USN flew the heritage 1955 Grumman F9F-6 and F9F-8T Cougar in the 2016 and 2017 Seasons and currently fly the Boeing F/A-18C and F/A-18D Hornet. Each team pilot, active, reserve or retired, has a unique aircraft that will never be assigned to another. The Bureau Numbers on the aircraft tails are unique. Following NFDTCO directives, the pilot's name may be included in future liveries. The Blue Angels support crew is made and flown in a Hercules C-130 belonging to the Marine Corps and is composed of Marines (C-130) and Marines and USN enlisted personnel (Ground). "Fat Albert" is the nickname given to the plane by Marine Corps Blue Angel pilots in the 1970s because of its size and shape. It is a reference to the popular children's cartoon of the same era. After you have the Cougar stock version NFDTCO will contact the manufacturer and you will receive from her the Blue Angels last version of the current model we fly. You will then proceed to apply the unique livery assigned to you as described below. 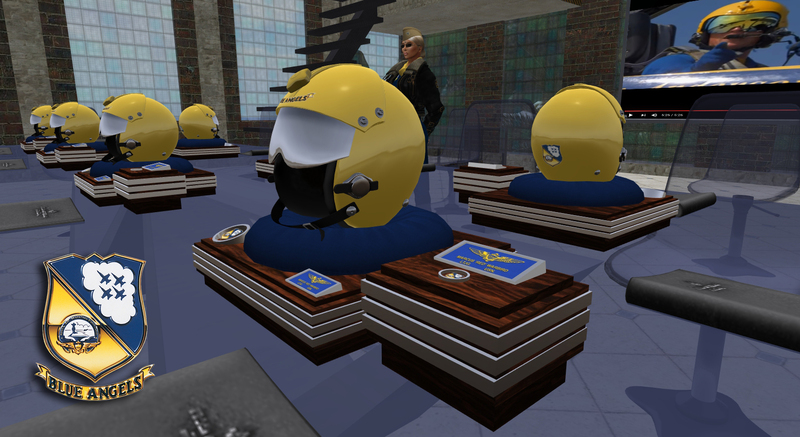 All Blue Angels active members MUST have active voice capability in and out of SL. The team uses voice for coordination and ALL team members need to be able to HEAR voice. For the positions of Angel 1, Angel 5 and Angel 7 you MUST SPEAK as well. Without speaking through voice you can not take one of those positions. As part of the USNSL structure, Blue Angels Naval Aviators will be issued a set of Navy Dress Whites and Navy Dress Blues by USNSL personnel department, and casual attire like ball caps and track suits by NFDT equipment department. SLMC pilots and crew must refer to their Corps for identical attire. Optional additions to uniforms (scarves, leather jackets, etc.) are approved by NFDTCO and used only before and after shows. On game days all uniforms are stripped of personal additional elements with the single exception of shades (recommended OFF for flight). The Blue Angels naval aviator cases. At the time of integration with the NFDT, each pilot is given two cases. This case also contains the note card with the current livery UUID's to be used in the stock drop box that paints the aircraft - each Blue Angels livery is unique, each plane has a unique BuNo. Main NFDT Blue Angels adopted flight suit combos and options. Above are the main flight suit combinations, from left to right, clean ground (shades and scarf optional), ground with shades, hand held helmet and scarf (optional), ground with shades, bomber jacket and scarf (optional), ground flight ready and flight VU and ground flight ready and flight V (all options except shades came off for show days - shades OFF recommended for flight). NOTE: the last 4 on the right represent ground and flight versions with visors up and visors down. You need to have at least two versions ready as outfits so you can change with a click: one ground flight ready and one flight. The main difference is that on the FLIGHT version you remove all extras not related to flight, such as military AO's and any other scripted items not needed. From the adopted flight suit you bought as required both male and female pilots will ONLY need the flight suit itself (it comes with boots on). Everything else is not used in the team. Note that the male version already has the yellow T-shirt on, the women will need the yellow T-shirt provided in the case mentioned above. The scripted helmet in the flight suit package is NOT our helmet, we use the ones provided in the case mentioned above. The garrison cap provided in the female version is NOT used, we use the one provided with the USN Service Tan Uniform mentioned above. REMARK: USMC female officers may use the USMC garrison cap provided in the flight suit package but need to place the correct RANK PIN on it. Communications are established in chat via a grid wide local chat comm system named GRIDTALKIE ( GT for short ) which has three tuners to which a number of selected channels can be assigned - this is exclusive to NAS Miramar officers and the communications pack dedicated to the Blue Angels is the TOP GUN pack, containing a common all packs NASM channel set to Tuner A, the BLUE (NFDT Blue Angels) channel and RED (NFWS Top Fun) channel assigned to Tuner B and a choice of civilian generic channels to be assigned to Tuner C, channels Blake or Marine. Tuner A's channel on chat is prefix 11, Tuner B's is prefix 12 and Tuner C's is prefix 13. The BASE menu is also accessed by 11 on chat. This is a GROUP TAG ONLY comm system. If you don't have the NAS Miramar group active (tag on) it will not attach and will not work. When you have it saved as part of a Blue Angels outfit and you change to that outfit with the wrong group on (wrong tag) the device will auto-detach. After receiving the GT pack and unpacking the process is simple. This will set your handle when you use the GT "radio" to communicate. This will bring up the GT menu. This will bring up the GT menu again. Characters for GT handles are LIMITED keep it as short as possible. Abbreviate your first name if necessary. To use the Blue Angels channel on Tuner B start all local chat with /12 - any GT team members with the set on will copy you anywhere on the Grid. That is the operational team channel. To use the civilian ATC/SAR channel use /13 - we choose MARINE in the North Continents (Gaeta V, Corsica, Nautilus). Should you be in the South Continents (Blake, Satori, United Sailing Sims) follow the above procedure for Tuner C and assign the BLAKE channel to it. NAS Miramar has two more packs similar to the one we use in the Blue Angels (TOP GUN pack). They all have Tuner A set to NASM - prefix 11. You can thus communicate with a Navy ATC officer at Miramar or any NAS Miramar Pilot using another pack as they all see NASM /11 comms.